encontrareis nuestras entradas de blog en inglés, ya que en nuestra gira no dispondremos de tiempo suficiente para traducirlas. After releasing ten studio albums, two live records, a live DVD and a ‘best of’ album of the early years, Tok Tok Tok are saying farewell with the exclusive recording of a Gershwin tribute concert that Tok Tok Tok performed in 2007 at the NDR Concert Hall Hannover with the prestigious NDR Pops Orchestra. An exclusive selection of George and Ira Gershwin’s classics performed in the tradition of Ray Charles and Aretha Franklin with arrangements by Morten Klein and Enrique Ugarte orchestrated especially for grand orchestra, ‘Gershwin with Strings’ includes hits such as ‘Fascinating Rhythm’, ‘It Ain’t Necessarily So’ and ‘Let’s Call the Whole Thing off’. The original concert titled ‘The Gershwin Side of Tok Tok Tok’ featured a sultry soul version of Gershwin’s ‘Summertime’, arranged by Morten Klein and orchestrated in Hollywood style. The two band leaders elegantly robed, Tokunbo Akinro in a long, flowy chocolate coloured ball dress and Morten Klein in tail tuxedo, brought the full glamour of Fred Astaire’s Hollywood to the enthusiastic audience of the sold out NDR Concert Hall. Vocalist Tokunbo Akinro and saxophonist Morten Klein are backed on the album by their faithful crew Christian Flohr on bass, Jens Gebel on fender rhodes and Matthias Meusel on drums who have accompanied Tokunbo and Morten in the studio as well as on tour all around the world for many years. Mixed by Icelandic sound engineer Hrólfur Vagnsson, with whom Tok Tok Tok recorded the first six albums. 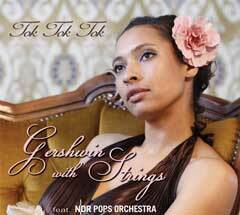 ‘Gershwin with Strings’ is due to be released September 2012 on BHM, Tok Tok Tok’s home record label. On 21st September, Tok Tok Tok will perform an exclusive release concert with the renowned Babelsberg Film Orchestra in Postdam. A big Goodbye Tour will follow thereafter, at which Tok Tok Tok will play a programme of highlights of the last 15 years as a farewell gift to their fans.